Do you have a book you have been dying to publish but you don't know how? I can help you get it to market using online publishing services. 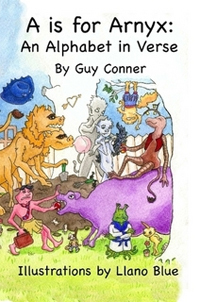 My current project is publishing A is for Arnyx for local author Guy Conner. I did the layout, art direction, publishing and marketing for this book. You can purchase the book here: A is for Arnyx or click on the image below. “A is for Arnyx” is in the tradition of Lewis Carroll, Dr. Seuss and Edward Lear  verse for children that also appeals to adults. Children will enjoy the simple rhymes and the (sometimes silly) humor. They’ll appreciate the fact that there is one verse (and one creature) for each letter of the alphabet. Adults will enjoy the more subtle forms of humor (“ratatattat” the sound a machine gun makes becomes a rat-like creature with two heads) and appreciate the use of a wide variety of verse forms. Both children and adults will appreciate the vividly imagined illustrations by Llano Blue  creatures conjured up from the merest hints of description in the verse.